After studying classical music for many years, Charles Gute shifted his focus to visual art, receiving a Masters of Fine Art in New Genres from the San Francisco Art Institute. 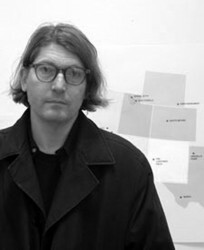 Gute’s work has exhibited at numerous museums across the United States, most recently at The di Rosa Museum, The Islip Art Museum, Berkeley Art Museum, and the Hammer Museum. International venues include The ZKM Center for Art and Akademie der Künste in Germany. In addition to museum and gallery exhibitions, Gute often creates specially commissioned projects for print publications such as Frieze, Flash Art, ArtLies, The Fillip Review and Cartier Art. He has been awarded fellowships from the Rockefeller Foundation and the San Francisco Foundation, and has twice been a MacDowell Colony Fellow. In 2010 he was selected for the Volunteer Lawyers for the Arts (VLA) Art & Law Residency Program. Gute’s work has garnered attention from publications such as ARTnews, Artforum, The San Francisco Examiner, Art+Auction, and New York Arts. The San Francisco Chronicle called him one of several “people to watch in 2014.” A monograph, “Revisions and Queries”, was published in 2008 by The Ice Plant in Los Angeles and is available through Distributed Art Publishers. His work is in the public collections of the University Art Museum, University of California at Berkeley; Printed Materials Archive, Mess Hall, Chicago; and the Permanent Art Collection at Indiana State University, Terre Haute. Recent group shows include Institutional Critique Flair Button at Southern Exposure, San Francisco; On Sincerity at Boston University College of Fine Arts, Massachusetts; De-accessioned at Cooper Cole, Toronto; I Like the Art World at EFA Project Space, New York; and A Painting Show at Autocenter, Berlin. Recent solo shows include Scripts for Art at Walden Affairs, The Hague; and Recent Works on Paper at Catharine Clark Gallery’s satellite space in New York. Based in New York, Gute has exhibited with Catharine Clark Gallery since 2004.